Hey there everyone! It's time for Sepia Scenes again! Glad to have you participate! I'll be around to visit as many of you as I can. I hope you like the Samuel Beckett quote below. We who love to post our best photos should feel uplifted by what he says. All art must inevitably end in failure. This is, clearly, no reason for surrender. Ever tried. Ever failed. Never mind. Try again. Fail better. Will you sign Mr. Linky and leave a comment? Thanks. I really appreciate it! Mr. Linky went haywire this afternoon after several of you signed on. I have your comments though, thank goodness! This tree is stunning, the white blossoms brilliant against the clouds. The sepia actually enhances the blossoms by muting all else but the white flowers. Nice picture and neighborhood! Love little ornamental pear trees - ours here in town are just about to start blooming. Sorry about leaving my comment this morning on last week's post - that'll teach me to not look closer! 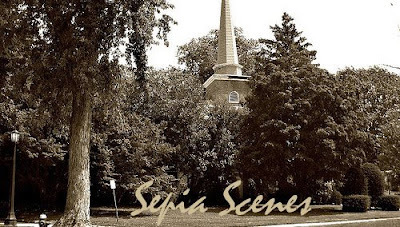 This is my first week on Sepia Scenes and I'm glad to participate :-) Your photo makes me feel "happy" with the beautiful tree in the front plan and the beautiful houses in the background. Have a nice day! Lovely, Mary. My neighbor just planted a pear tree, but I don't expect any pretty blooms for another year or two. Most all of our blossoming trees and shrubs have blossomed and gone; magnolia, dogwoods and azaleas. Spring seems like it will never get here and suddenly, it's gone. This is my first time participating is Sepia Scenes! I'm on wordpress now! Pretty little tree, I've never seen one of those before. How lovely to see the flowers blooming again. It won't be long now for us either. I noticed that some of the Tulip trees have buds opening in Toronto. this reminds me of my aunt and uncle's neighborhood in norther Wisconsin from when I was growing up. Nice memory. I should put that on a t-shirt. Probably been done already, huh? I like the sun faded filter on this, Mary. It softens the photo a little and lends a hint of mystery. I love how white the blossoms turned out. Very nice. 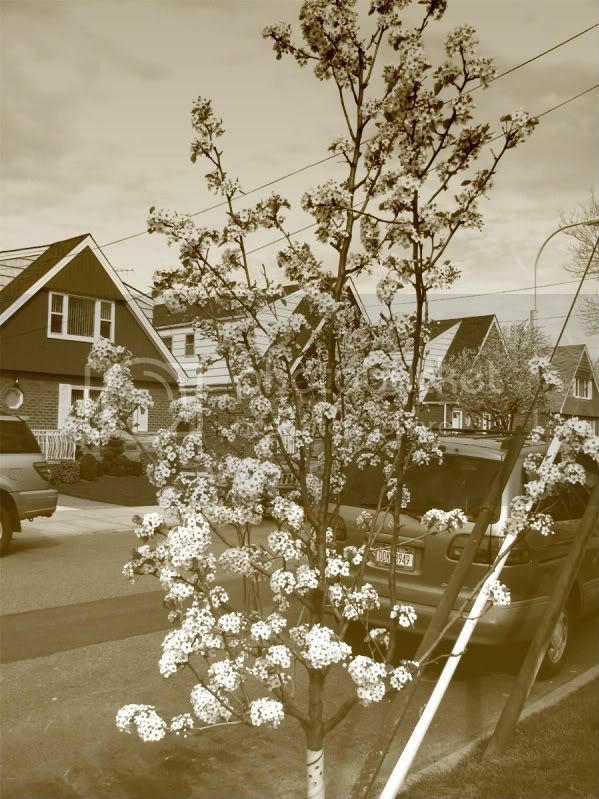 Oh, those blossoms really pop out in sepia. Nice! Our pear tree blossoms every year but has never produced. It wants a companion! My entry is up. Happy SS! The sepia works well as a background for the delicate white blossoms. "This is, clearly, no reason for surrender. Ever tried. Ever failed. Never mind. Try again. Fail better. "I love the Never mind. Has SS gone back to the normal time? I love the blossoms this season and your photo highlights their beauty. Cool quote too. The photo is lovely, the blossoms so beautiful against the background. Wonderful in sepia. Those houses and tree are beautiful! i shared a photo for today...its a bit of a cheat coz its not new but i hope you like it! Pretty tree! Our Pear tree is getting ready to bloom, but hasn't quite made it all the way out. It's a real Pear tree, not ornamental. Have a great day!! What a lovely tree! Nice sepia! These are the same trees I have in my complex! Didn't know what they were called. Beautiful. Thank you. I do like the quote but I do want to succeed eventually... Maybe on my last work of art before I die. I have my post up this time! That's a lovely tree in bloom! Nice treatment too with the photo. Mine's SS entry is up!